Pete Conrad, spásaire Meiriceánach ag dul i mbun oibre le Suirbhéir 3 ar an nGealach. Tá Apollo 12 le feiceáil sa chúlra. Is éard a bhí i gceist leis an gclár Surveyor céim NASA (ina Saotharlann Scairdtiomána) i 1966-1968 chun spásárthaigh róbatacha a chur i dtír go bog ar dhromchla na Gealaí mar ullmhúchán d'aistir Apollo a mbeadh spásairí orthu. D'éirigh le 5 iarracht as 7 gcinn teacht i dtír go rathúil, agus rinne siad tréithe na n-ionaid tuirlingthe a thomhas is íomhánna lánléargais a tharchur ar ais ar Domhan. Rinne siad anailís cheimiceach ar na carraigeacha, ag cinntiú gur carraig bhasaltach a bhí ann i bhfad roimh fhilleadh spásairí Apollo le samplaí tástála. 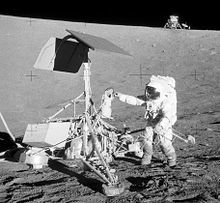 D'éirigh leis na spásairí ó Apollo 12 an ceamara is an scúp ó Suirbhéir 3 a fháil ar ais óna ionad tuirlingthe in Aigéan na Stoirmeacha. Tugadh an leathanach seo cothrom le dáta an 8 Meán Fómhair 2015 ag 05:48.